Paintless dent repair (PDR) is a method of removing minor dents from a vehicle without disturbing its finish. Paintless dent repair is a great, cost-effective solution for hail damage or other similar dents and dings. If the finish has not been compromised, PDR can usually be used! Read on to learn more about the benefits of paintless dent repair. Traditional dent repair works by filling in a dent with paint or body filler. 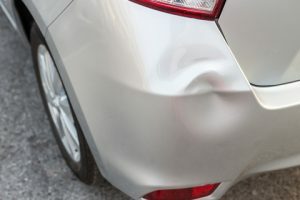 The actual dent in the vehicle remains, it is just filled so that the appearance is restored. This method is used when dents are too severe or when the paint/finish of the vehicle has been compromised. As the name suggests, with paintless dent repair there is no need for paint, fillers or sanding. Technicians will gain entry to the dent by removing panels, lights, etc. – whatever they need to in order to get a clear pathway to the back side of the dent. Once a pathway has been established, special tools are then used to slowly massage the dent out, restoring the panel back to its original position. Environmentally friendly. Paintless dent repair eliminates the use of paint, chemicals, and fillers. Quick turnaround. Get back on the road in a just a few hours, as opposed to a few days or even weeks. Cost effective. Paintless dent repair can be more budget friendly than other traditional dent repair methods as there is no need to mix and apply paint. Seamless repair. Because no new paint is used, your vehicle will maintain its original colour and finish. Freeway Auto Body is Edmonton’s collision repair experts. If your vehicle has hail damage or other small dents and bends give us a call to see how our team can help!